The three of us were camped in Indian Canyon on the east side of the White Mtns, about a mile inside the Nevada Border. We were awake around 6a, the sun already up and the day promising to be a warm one. The plan was to tackle a few of these summits listed in Zdon's Desert Summits before Patrick was scheduled to leave us in the evening. The first peak was located less than a mile away to the north, but almost 2,000ft up a steep, crappy-looking slope. At least we wouldn't have to drive anywhere to start with. Zdon describes a route from the north that is six-miles roundtrip with 2,900ft of gain. Our route would be both faster and far shorter coming up from the south. Perhaps he didn't consider this route because it looks pretty horrendous from the road in the bottom of Indian Canyon. In fact, the climb turns out to not be so bad at all. Though it looks terribly loose, the footing was pretty good going both up and down. By doing it early in the morning we did not suffer from the heat, and there was considerable shade that could be taken advantage of. It was, however, steep going almost from the start, and it would take a lot of legwork to cover the mile distance. The lower slopes are fairly open and easy to navigate. Nearer the summit area, mountain mahogany and other trees require more care to get through or around. Getting ahead of the others, I arrived at the highpoint, found at the south end of the long summit ridge, around 8:15a. I had first gone to another point about 10ft lower more to the north before realizing where I needed to go. I spotted Patrick about 15min later some distance away heading to the far northern point. I caught his attention with a shout and 10 minutes later he had wandered through the maze of tree, brush and rock to join me. We signed a register left by Guy Dahms in 2013 and then waited some for Laura. We began to worry that she might do the same as Patrick and head north, so after more waiting we decided to head off in that direction so as better to intecept her. We had covered just shy of half the distance when Laura caught sight of us from behind, having reached the point I first mistook for the summit. We pointed out the location of the actual summit so as to return there, but Laura was hardly as particular as the two of us about reaching some exact point in time and space. And so after a brief rest, we all headed back down, returning much the same way to get us back to our vehicles by 10:15a. I half-expected Patrick to call it a day after this, knowing his penchant for getting home early, and this is exactly what he did. After packing up camp, we drove back down to where I'd left my van the previous day in Fish Lake Valley and said goodbye to Patrick. Laura and I still had the rest of the day and Sunday to play in the hills more. Given the heat, we decided to drive up to Queen's Mine on the north side of the range to tackle Mustang Mtn. Unfortunately, we found the road rougher than expected and Laura's Element suffered a flat. We had the spare tire swapped out pretty quickly, but it was not advisable to continue driving to the trailhead. We drove back down to US6 where we'd left my van and I tried to fix the original tire with the repair kit I carried. Failing this, Laura decided to drive back to Bishop to see if she could get it fixed properly at a repair shop. We tentatively agreed to meet later in the day to hike in Yosemite on Sunday, and parted ways. As I drove west across SR120 I was searching for something I could do in what was becoming an oppressive heat. I figured it might be cooler near Sagehen Summit at 8,000ft, and found a couple of unnamed summits east of the pass. I parked west of Peak 8,580ft and headed across a sloping desert towards the summit less than a mile away. This area south of Mono Lake is composed of minor hills and summits, desert scrub and lots and lots of sand. With the temperature at 85F and nothing but sand to climb for nearly 800ft, there was no way to describe this as "fun". The class 2-3 summit outcrop was the only redeeming feature on the mountain save for the views (nice one of Mono Lake to the northwest). 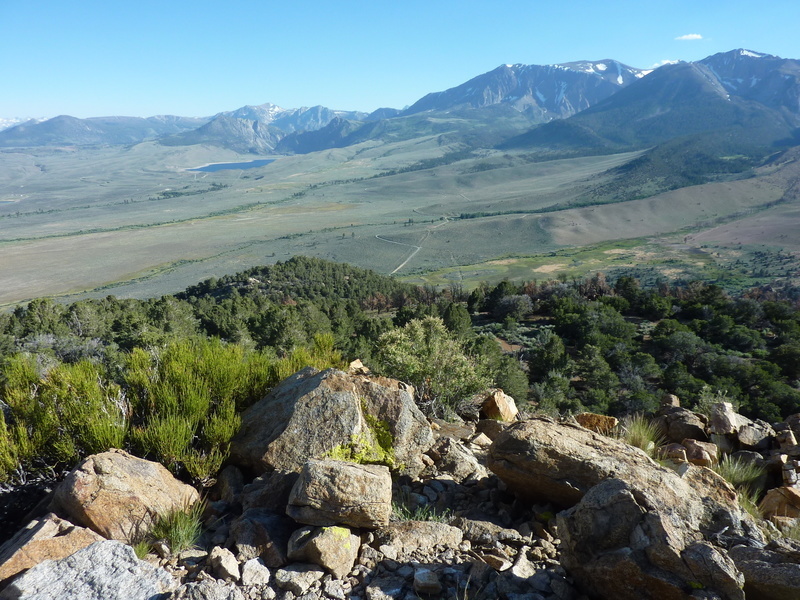 A fire near Lee Vining left a good deal of haze across the landscape, though not as bad as the day prior when we were atop the White Mtns crest. I had originally planned to continue to Peak 8,340ft another 3/4mi to the northeast but as far as I could see, all the terrain consisted of yet more sand. I started down briefly in that direction but soon came to my senses and capitulated. This just wasn't any fun. Back in the van I cranked up the air-conditioner and headed west. As I was driving north on US395 I noted an interesting summit I soon discovered to be Williams Butte. This good-looking summit south of the US395/SR120 junction has more than 500ft of prominence and had been climbed by the likes of Andy Smatko and Gordon MacLeod - plenty enough reason for me. It was still too warm out (94F) to consider it, but I thought perhaps I could eat an early dinner and wait until later. I hung out at the Whoa Nelli for more than an hour, enjoying some buffalo meatloaf. Laura contacted me during this time to report that she found no repair shops open in Bishop. Further, a friend was in town and offering her a ride up to Coyote Flat, which she readily accepted. I was on my own again. I waited until 5p before heading out to Williams Butte. It had cooled back to 85F which was far from ideal but would have to do. I followed the dirt Horse Meadow Rd (Forest Road 1N16) west from US395 for about a mile to a junction. The left fork, which winds around the east side of Williams Butte, looked to be in not-so-great shape so I opted for the right fork which I followed a short distance to the lovely Horse Meadow. I must have driven by here a 100 times and never knew this scenic area existed. I was almost due north of Williams Butte, whose summit could easily be seen from the start, little more than a mile away. I walked across the meadow's dry, fluffy tufts (this could be absolutely awful earlier in the season when it's wet and marshy) to the base of the mountain before climbing more sandy slopes up to the summit. It took me just under an hour to reach the rocky summit, climbing it from the easier south side where it is standard class 2. It had an even better view of Mono Lake than the previous summit with the added bonus of being able to watch helicopters fetching water from the lake to fight the fire that could still be seen burning to the north on the slopes of Mono Dome and Lee Vining Peak. The summit register proved quite popular - there were three booklets filled with way too many entries to photograph, so I simply signed in on the more recent one and stuffed them back where I'd found them. I descended off the north side (class 2-3) of the summit rocks, then down a variation to the north, finding it much like the ascent route I had used. It was after 6:45p by the time I returned, still quite warm out. Driving up towards Tioga Pass proved far cooler and it was in the 60s when I found one of my usual spots to camp near Ellery Lake.